In the last few years we have witnessed, in the very pages of this magazine, a debate on whether or not NATO has become an anachronism of the Cold War, which might have made sense when the West was confronting the former Soviet Union, but makes no sense now, in fact, some maintain, it needs to be jettison from present politics, if for no other reason that the EU needs to make its own decisions without interference from the US. Usually the issue is debated within a framework of one century, beginning with the start of World War I in 1914. Let’s revisit the issue in the light of the latest development from the Ukraine and also from an historical perspective that goes beyond 1914 by a few centuries. If we do that we may be surprised at how different the whole issue begins to appear. As we speak, Russia has de facto annexed Crimea and is invading the Eastern part of the Ukraine while the EU has issued an ultimatum of one week before more stringent economic sanctions are approved and implemented. Putin, as the bully that he is, will predictably ignore the ultimatum and go ahead with his interference in Ukrainian affairs. One hears little from EU leaders about strengthening NATO and reinforcing the defenses of all NATO countries. So one may ask: after the downing of an airline over the Ukraine with Soviet provided missiles causing the death of a couple hundred Dutch, are second thoughts being entertained about the viability of NATO? Let’s see. It should be obvious to most observers, at least those who do not consider truth simply what is convenient to oneself, that the incursions of Russia into the Ukraine has put to rest the idea, some have called it a myth, that the end of the Cold War has brought permanent peace to Europe, unless we are talking of the permanent peace of a cemetery or a desert where nobody speaks and no controversies ensue. Do we need to brace ourselves for new realities on the ground? Is Russia farther than ever from the West? Which leads to this question: is Putin testing the NATO alliance’s purpose and commitment? Is US secretary of defense Hagel correct in calling what is going on a “clarifying moment” for the alliance? The time to take a second look at the complacency of the EU in thinking that it had a benign Russia on its eastern borders; the kind of benign cute Disney-like little bear shown by Putin at the Winter Olympics a few months ago, just before he annexed Crimea. What did Angela Merkel mean with this statement made at the White House: “post-Cold War order has been put in question” by Russia’s aggression. Why did NATO, who has had a formal relationship with Russia since 1997, suspend cooperation with Moscow in light of the Ukrainian problem? What did NATO’s second ranking official, Alexander Vershbow, mean by saying that Russia has compelled NATO to begin viewing it as an adversary. Given that US defense spending on NATO’s collective defense is three times the combined spending of all the EU allies, should they bear a greater share of that defense? Is the end of history really here with the end of the Cold War and the end of European insecurity, a Fukuyama proclaimed some time ago, thus making NATO irrelevant? Is NATO responsible for fomenting conflict with Russia, as some maintain, in as much as they allowed former nations in the Soviet sphere of influence to enter NATO? Or has the West as a whole sought partnership with Russia in as much as their security interests seemed to be converging? Is Russia still a democratic country, or a half-hearted one? One wonders. Some may say that the above analysis is highly biased and does not take in consideration Russia’s side of the story. They claim that Page 1 of 4In the Western media which has a very short attention span, not to speak of ignorance of historical perspective, the prevailing image is that Russia is an aggressor, intent on dominating its neighbors. Western influence is presented as “positive.” Russian influence as “negative.” Joining the EU is depicted as being a road to economic and social prosperity and NATO is offered as a defensive bulwark against the “terrible” Kremlin. Remarkably, at least in the United States, liberals and conservatives are singing the same song. Further, the discourse of “invasion,” “occupation,” “aggression,” and “World War III” is hardly diplomatic. How does anyone believe that negotiations can ensue when such language is thrown about? Of course the other side of that coin is that, if we have learned anything from the beginning of World War II, it is that appeasing of a bully usually means that the bully has to paid later with greater loss of treasure and blood. In any case, by contrast, in Moscow, the view of the situation in Ukraine is quite different. It perceives the West as encroaching on countries to which it has been very closely associated. Ukraine (the entire country, East, South, Central, and even West), along with Belarus, is viewed as a fraternal East Slavic nation to which Russia is intimately bound. 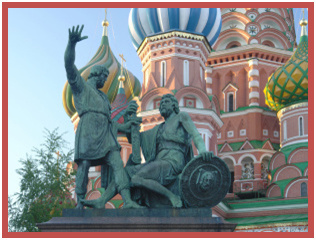 The capital Kiev is regarded by all Russians as the “mother Russian city,” the common point of origin for all East Slavs. To view Kiev within the boundaries of the EU and NATO is more than just a violation of a sphere of influence. It is a violation of one’s historical heritage. All of which of course does not excuse the use of KBG stratagems to violate the territorial integrity of neighboring sovereign countries. It does not help that some of the most vocal advocates for Ukrainian membership in the EU and NATO come from countries that Russia perceives as historical invaders. They include Poland and Sweden, the co-founders of the Eastern Partnership program that sponsored the Ukraine-EU Association Agreement. Both countries have a history of animosity toward Russia, but it is Poland in particular that Moscow views as being one of the chief advocates for Western expansionism. 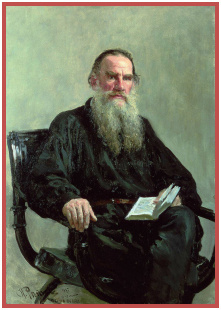 Russian author Leo Tolstoy in 1887. In another Tolstoyan parallel, Moscow also likely views the Ukrainians who protested on the Maidan as being the modern equivalents of the muzhiks of War and Peace. It was the muzhiks who rose up against their oppressive landlords for Napoleon, who they viewed as the embodiment of the French revolutionary ideals of liberté, égalité, et fraternité. Today though, the modern landlords are Ukraine’s corrupt political elite and oligarchs, while the liberal ideals of Napoleon and revolutionary France are today the liberal ideals of Brussels and the European Union. Moscow regards the latter ideals in 2014 just as they regarded Napoleon’s ideals in 1812 – that is, as false promises motivated only by geopolitical ambitions rather than by any genuine sense of altruism. While we should be clear-eyed about the present situation in the Ukraine and remember the bully Hitler, and take Putin’s propaganda machine with a big grain of salt, on the other hand we ought not forget history and its lessons so that we do not end up in another World War by permitting that empty rhetoric, unsupported by the historical facts, gets out control. NATO did not come out of a cloud, it has historical precedents and we better know what they are, before we rush to a mindless defense of democracy, freedom and Western ideals, which in the past have been breached more than observed.